Suzyn Waldman (born September 7, 1946) is a sportscaster and former musical theater actress. Since the 2005 season, she has been the color commentator for New York Yankees baseball, working with John Sterling on radio broadcasts, first for WCBS-AM and currently for WFAN in New York City. Waldman was born in Newton, Massachusetts, and she graduated from Simmons College with a degree in Economics. Prior to her broadcasting career, Waldman worked for many years as an actress and singer in musical theatre. Her most notable role was as Dulcinea in Man of La Mancha. Her rendition of "There Used To Be a Ballpark" appeared on the 1995 WMHT-TV documentary Local Heroes: Jason Ziemann and Baseball on Capital Region Diamonds. Also, she has performed the National Anthem at many Yankee home games. She has worked in sports reporting for more than 20 years, as a former broadcaster for the YES Network as the reporter on the New York Yankees Pre-Game Show and the New York Yankees Post-Game Show and New York sports radio station WFAN. Her voice—on a live sports update—was the first heard on WFAN when it premiered on 1050 AM at 3:00 PM on July 1, 1987 (it moved to 660 AM a year later). At WFAN, she covered both the Yankees and the New York Knicks basketball teams and co-hosted the daily mid-day sports talk show. Following the 2013 season, the Yankees moved their radio rights to WFAN, and announced that Waldman and John Sterling would return for their tenth year together in the booth. She signed a two-year contract extension in February 2016 that runs through the 2017 season. At the start of the 1987 baseball season, Toronto Blue Jays outfielder George Bell wasn’t talking to the New York media, thinking they had cost him the Most Valuable Player award the year earlier. He broke his silence after a win at Yankee Stadium, and expectedly the regular beat writers hurriedly gathered around his locker. New on the beat (women had just recently been allowed access to the locker room), Waldman joined the group; Bell immediately started screaming at her in Spanish and English. "There was a deathly silence. I think the other writers were shocked, but I also think they still resented me more than a bit, and they certainly didn't want to lose this interview," she recalled on a radio show. "At the time I was a little less tough than I am now. Tears welled up in my eyes and I said I better get out of there." As she hastily gathered her tape recorder and notebook, she heard Bell's fellow outfielder, Jesse Barfield, ask a fellow writer, "What's her name?" When told, he then called out to her: "Suzyn, I went three for four today. Don’t you want to ask me any questions?" Waldman and Barfield, now a baseball announcer himself, became fast friends and have remained very close since. In 1985, Yankees owner George Steinbrenner sent GM Clyde King to fire manager Yogi Berra, which greatly angered Berra because in his previous firings, the team owner had personally delivered the news. Yogi vowed not to visit Yankee Stadium and not to participate in any Yankee function as long as George Steinbrenner was still the owner of the Yankees. In 1999, Suzyn Waldman helped arrange a meeting between the two men that brought an end to the 14-year feud. Yogi returned on Opening Day of the 1999 season, a day also designated as "Joe DiMaggio Day." In an online poll by Newsday, Waldman was voted the worst commentator in New York by the fans. New York Daily News columnist Bob Raissman has given Waldman the derisive nickname "Georgie Girl", an allusion to her close relationship with Steinbrenner (and a play on the title of the 1960s hit song "Georgy Girl"). WFAN-AM host Mike Francesa along with former co-host Chris "Mad Dog" Russo poked fun at her over-the-top reaction to the Roger Clemens signing in which she exclaimed "Roger Clemens is in George's box, and Roger Clemens is coming back. Oh, my good goodness gracious! Of all the dramatic things I've ever seen. Roger Clemens standing right in George Steinbrenner's box announcing he is back. Roger Clemens is a New York Yankee." Suzyn eventually confronted the duo in a long expletive-laced tirade, in which she expressed her obvious embarrassment of the situation. After the conversation, Mike and Chris vowed never to play the clip again, only to play it repeatedly later on in the evening. The clip is also played to mocking effect on Boston sports radio WEEI and for comedy on Boomer and Carton in the Morning, The Opie & Anthony Show The Howard Stern Show, The Jim Rome Show, and ESPN Radio's The Herd with Colin Cowherd and The Dan Le Batard Show. In 1996, she was diagnosed with breast cancer. She eventually sued Mount Sinai Hospital and two of its pathologists for misdiagnosing her as being cancer-free, winning over $2 million in damages from the case. While her chemotherapy regimen limited (and eventually ended) her day-to-day role of broadcasting Yankees games on TV, she continued in her role at WFAN throughout her illness (now long in remission). Suzyn Waldman is currently a resident of Croton-on-Hudson, New York in Westchester County. ↑ Curt Schleier (2005-04-01). "A Voice For The Ages". The Jewish Week. Retrieved 2007-06-29. ↑ Joanne Korth (2005-04-17). "Broadcaster in a league of her own in Yankees radio booth". St. Petersburg Times. Retrieved 2007-06-29. ↑ McCarron, Anthony (August 10, 2014). "'94 The Season That Wasn't". New York Daily News. p. 71. Retrieved May 15, 2015. ↑ "John Sterling, Suzyn Waldman to call Yankees games on WFAN". Newsday. February 14, 2014. ↑ Harvey Araton (1999-01-06). "Sports of The Times; Yogi and the Boss Complete Makeup Game". NY Times. Retrieved 2016-05-12. ↑ Chuck Slater (2000-02-13). "Baseball Announcer Who Broke Barriers". NY Times. Retrieved 2016-05-12. ↑ Neil Best (2007-06-24). "Vote: Favorite radio/TV personalities?". New York Newsday. Retrieved 2007-06-26. ↑ Neil Best (2007-06-24). "Announcing what the fans think". New York Newsday. Retrieved 2007-06-26. ↑ Bob Raissman (2010-07-16). 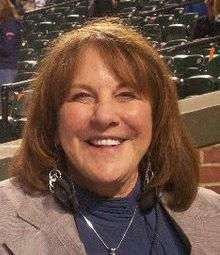 "Yankees radio announcer Suzyn Waldman cultivated unique relationship with owner George Steinbrenner". New York Daily News. Retrieved 2011-02-01. ↑ "Roger Clemens is BACK!". WCBS. 2007-05-07. Retrieved 2007-06-22. ↑ Neil Best (2007-05-22). "NBC's ill-timed lineup shift". New York Newsday. Retrieved 2007-06-22. ↑ "WEEI – Dennis and Callahan – Jerry Remy". WEEI. 2007-05-09. Retrieved 2007-07-01. ↑ "WEEI – Pete's Bits – Tickle Me Suzyn Waldman Doll". WEEI. 2007-05-08. Retrieved 2007-07-01. ↑ "WEEI – Pete's Bits – Suzyn Waldman Gushes over Roger". WEEI. 2007-05-07. Retrieved 2007-07-01. ↑ John Sterling and Suzyn Waldman (2007-08-09). "Postgame Clubhouse Report". WCBS Newsradio 88. Retrieved 2007-08-10. ↑ Richard Sandomir (2007-10-09). "Yes, There Is Crying in Baseball (and It's OK)". New York Times. Retrieved 2007-10-09. ↑ Neil Best (2007-10-11). "Suzyn Waldman defends her on-air sobs". Newsday. Retrieved 2007-10-19. ↑ "SPORTS PEOPLE: BASEBALL;Waldman Sues Hospital". New York Times. Associated Press. May 22, 1996. Retrieved June 29, 2007. ↑ "Waldman Sues Hospital". New York Times. Associated Press. May 22, 1996. ↑ Tarr, Peter (July 2000). "Never Give Up! The Courageous Story of Suzyn Waldman". InTouch. Retrieved 2007-06-30.